The circulation of matter mediated by living things is also a chain of life forms. Our life is supported by the life of other plants and animals. For us to live healthy and rich lives, plants and animals supporting our lives also need to be healthy and full of life. The main purpose of Nature Farming is to produce crops which are healthy and full of life and to supply them to consumers. 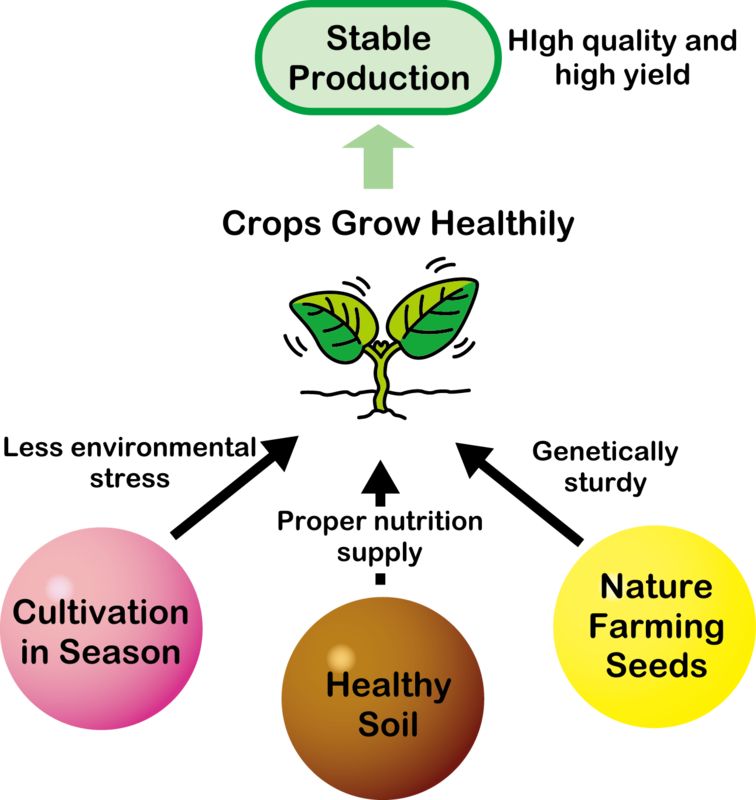 Since crops are a source of our lives, they must be safe and be produced stably. A productive soil has a developed structure, is mellow, is equipped with a moderate water permeability and drainage as well as a good water-holding capacity, retains fertilizer well and contains many and various soil microorganisms. Such soils can be seen in forests and lake areas. We think it is most important to nurture soil,* in which good humus in the soil is increased and rich soil organisms are nurtured. To nurture soil, it is indispensable to utilize unused resources in the local area and to produce organic matter during fallow periods. In addition, it is also necessary to use seeds which have the vital power to produce offsprings even in severe environments, to cultivate crops in seasons suitable to their physiology and to try not to depend on production materials and chemical materials.